A beautiful face with bright red lipstick and brooding eyes and a bold caption proclaiming Blood Red Sari on the cover page, captivated me, while I was deciding which book to read after Arjuna from my ever swelling TBR. But, this time the cover page was competing against the intriguing Wordkeepers and only after I had finished Jash Sen’s debut novel, that I could begin with Blood Red Sari, Ashok Banker’s latest saga. Once again, the beginning floored me. The prologue is titled as Kali Pujo, and the story begins with a woman, presumably Bengali, offering oblations to Maa Kali for her benedictions. Apparently, the mysterious woman has suffered a lot in the last one year. Her maladies were such that she almost lost faith in the might of Goddess, but by divine grace, she does overcome her obstacles and is now a prosperous woman and an ardent devotee. The prologue intrigued me and I was left wondering why all my eBooks are turning out to be based on Indian Mythology and Gods. But, little did I know that it was nothing but a “Mayavi” delusion created by my quick successive reads of the stories of Indra, Arjuna and Ashwathama. I couldn’t be farther from truth as the very next page belied all my biases. The story is as modern as it could get. There is not even an iota of myth in it, at least the conventional, moral ones. On the contrary, Blood Red Sari, takes it upon itself to defy all the old aged beliefs and prejudices as far as sexual inclinations and women liberation is concerned. Before I jump headlong into the summary, let me praise Ashok Banker for an exquisitely crafted story that had me on tenterhooks for past three days. The novel is structurally perfect, neatly divided into 15 chapters, with each chapter itself consisting of three parts. The story revolves around four women Lalima, Anita, Nachiketa and Shiela, based in four different locations in India. Anita is in Mumbai, Shiela a gym trainer in Kolkata and Nachiketa a fiery lawyer in Delhi. One fine day, they receive a yellow manila envelope and from that very moment, their lives undergo a drastic change. Their well settled careers are thwarted, they are abused by goondas and chased by Police and assassins. Why has the world turned against these women? What wrongs have they committed to become targets of combined forces of lawmen and criminals? What is their connection, when on the surface, they live in different states and do not even know each other’s name? And, why all of them have received a similar envelope on the same day? As I read on, the story became more and more interesting, the circumstances changed rapidly, the pace fastened and I had to literally run along breathlessly, trying to glean as much information as I could. The end result, a breathtaking superb thriller with strong women protagonists and a well plotted story. 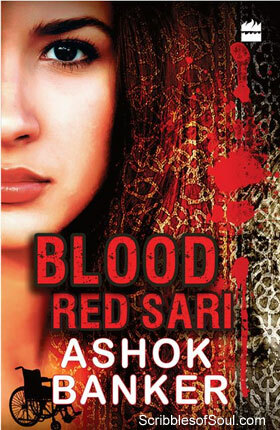 Needless to say, I quite enjoyed my time with Blood Red Sari by Ashok Banker. I loved the novel for its freshness, its strong focus on independent women who are bold enough to tackle the male dominated society head on. In fact, I was awed by Nachiketa’s spirit, Shiela’s agility and Anita’s loyalty. But, the novel does have some glaring nicks. First and foremost, I found the lesbian angle and the choicest abuses hurled by Anita and her family a bit forced, more to grab eyeballs and create scandal than to be actually relevant to the plot. I am not a moralist, but the extra focus on sexual inclinations was hardly conducive to the storyline. Almost, similar was my reaction when, all of a sudden, Shiela was shown to be a bit too intimate with a shady Chinaman. In a novel, trying to portray women as strong protagonists, the objectification of desires was not at all necessary. I found it hard to digest that the bold Shiela could find no alternative in her quest to unravel the mystery other than becoming bed-mate of a well connected smuggler. These episodes smacked of a zealous attempt at enticing the readers with sleaze and controversy, hardly in line with the book’s initial focus on the evil human trafficking trade. But, despite these hitches, the story was quite addictive. As I said before, the novel is structurally magnificent. I was surprised by Banker’s smooth running of three parallel plots, never losing a thread and maintaining the sequence of events perfectly. Though, initially, I was a little confused by the sudden changes in location. As the story began in Kerala, right after a prologue set in Kolkata, I struggled to make the connection. Though, as I progressed the plot became crystal clear and I quite enjoyed the story. But, in the last few pages, I was disappointed by a sudden change in the motive behind the attacks. The human trafficking was ignored for a more horrifying reason. The haphazard theory put forward by Hakkadi (Interesting name though) went over my head at jet speed and I just felt that the narrative derailed in the final stages of climax. Perhaps, it was a deliberate twist to intrigue the readers for the forthcoming books of Kali Rising tetralogy by Ashok Banker. And, hopefully the author would be able to justify his standpoint in the next books. Blood Red Sari does have potential, but is spoilt a little by focusing on too much sensationalism. The novel was good in the beginning and great in the middle, but the end has left me utterly disillusioned. Hopefully, the sequels would mend the error. Till then, I am keeping my fingers crossed.